I'd rather have a real box of cupcakes, but if I was handed this box I'd be fine with that too! I received my pre-order shipment of new Stampin' Up! products and have been doing a little playing around. I gotta tell you...and believe me, I will always tell you... I'm really not fond of these new colors! I'm a good team player though so I'm sure you will see me use them from time to time...as soon as I get some bifocal sunglasses so I can see and tone down these BRIGHT colors! Today's project uses the new Razzleberry Lemonade DSP. It's designed to go with the new In Colors. However, I gotta ease into this you know, so I made due with core Stampin' Up! colors. It seems to match just fine which is a great thing about Stampin' Up! They are very aware that everyone can't invest in new In Colors just to use the new DSP's. Kudos to Stampin' Up! for that! 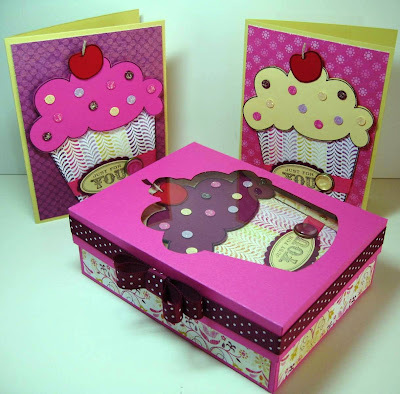 I made a standard A2 card box and lid to fit cards sized 4-1/4" x 5-1/5" using the Simple Birthday Thanks stamp set. It holds 6-8 embellished cards and envelopes perfectly. 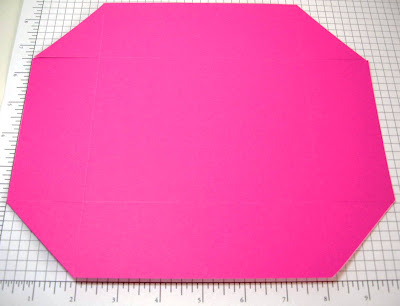 The box base is 10" x 8-1/2" of Pink Passion cardstock. Score at 2" on all 4 sides. Cut on the score lines up to the intersecting lines on 2 sides and trim corners off at an angle like I've done in the photo. Box lid is 6-5/8" x 8-1/8" of Pink Passion cardstock. Score at 1" on all 4 sides. Cut on the score lines up to the intersecting lines on 2 sides and trim corners off at an angle like I've done in this very blurry photo. Before we go on, I want to show you what I did to my Simple Birthday Thanks stamp. I love this cupcake, but my kids are too big to use it with these words in the center of the cupcake...so I took an X-acto knife and carefully cut that part out. Now, it's a perfect stamp! Sometimes you have to alter things to fit your needs, right? 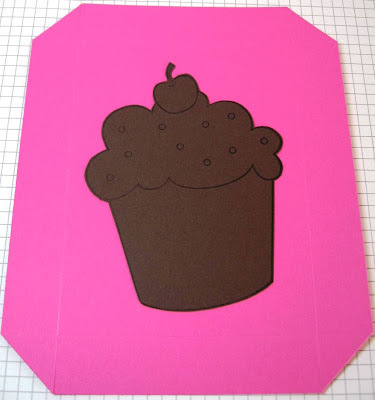 Stamp on a scrap piece of cardstock and cut it out to use as a template for the lid. Lay the template on top of the lid at desired angle. Trace around it with a pencil. 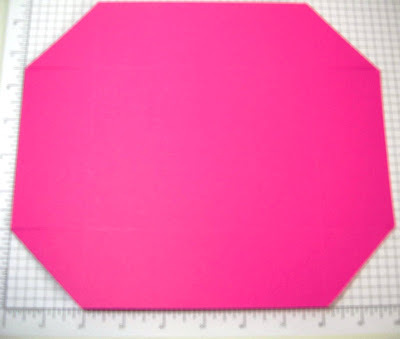 Poke a hole in the center and hand cut out with scissors. Fold on score lines, assemble the box lid and box bottom. Cut a piece of transparency paper, over head projector paper, window sheets, anything that is see-thru to fit on the inside of the box. Secure with adhesive. I added strips of DSP to the box bottom. Two strips of 1-3/4" x 5-3/4" and two strips of 1-3/4" x 4-1/4". Put the cards in the box so that the cupcake shows through. I angled my cut-out to mimic the same angle as the cards. As you can see in the very top photo, I added a strip of Rich Razzleberry Polka Dot Grosgrain Ribbon around the box adhering it with Sticky Strip. 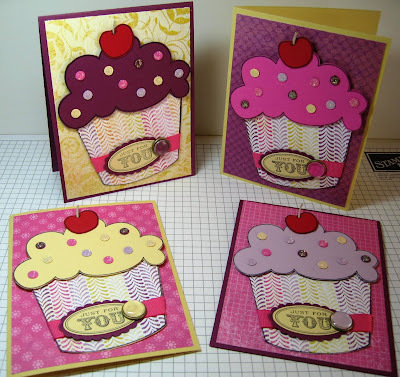 Top left: Cardstock is Rich Razzleberry base with Rich Razzleberry cupcake. Top right: Cardstock is So Saffron base with Pink Passion cupcake. Bottom right: Cardstock is Rich Razzleberry with Pale Plum cupcake. 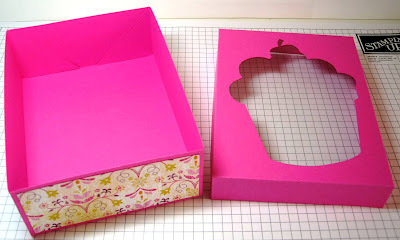 Have fun creating your own stationary box! Those are SOOOOOO freakin cute!!! I love them!! ok Becky, I hardly ever comment even though everything you make is simply beautiful! 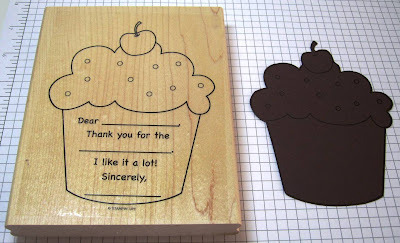 However, I have to say a huge Thanks for the idea about the cupcake stamp! I LOVE that stamp, but hate that there is a BIG saying in the middle (that's why I never bought it), what a genius idea to exacto it out! Why didn't I think of that????? Anyway, thanks for the inspiration...keep it coming! Oh my gosh! What a wonderful & clever idea! You are just so imaginative I can't believe it! that is SUPER CUTE, you are so clever, i love what you did with that stamp! OK, seriously, this is the cutest thing I've ever seen!!! 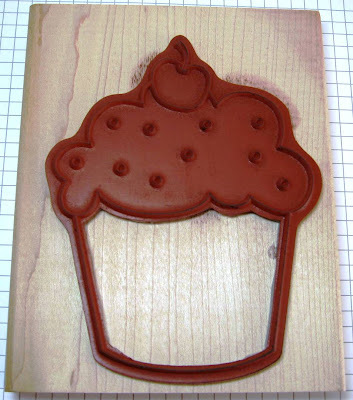 I'm now considering buying that super cute cupcake stamp. Thanks for the inspiration! Thanks for your wonderful inspiration!!!! Great card set! I love how you cut out the center of your cupcake. I might try and do that with mine too! thanks for sharing. Wow, love this project! The cutout on top of the box is perfect with the cards!! Becky you are so creative. I love the new colors! Perfect for fall. I am sure you will come up with some beautiful cards with these cards once your creative juices get flowing! This is a wonderful idea. As always, you have inspired me! You did an awesome job with this project and the colors came together beautifully! Thank you for sharing your creative genius! Blessings to you! Great idea about cutting out the centre also...you could even stick it on the back side of the block to use as you like. wow what a great idea your tutorials are so easy to follow thank you so much for sharing them with us. I agree the new colors are just a little to bright and will take a while to grow on me. First of all, I was going to get rid of that stamp, because like you, I have not use for the inside of it. But now you gave me the idea to cut out the middle. Why didn't I think of that? And I love the cards and box. What a cool idea. Thanks for being brave enough to say you don't care for the In Colors! I thought it was just me. :] I like the Soft Suede and the Bermuda Bay (in small doses) but the others are a bit too much! Maybe because I have 2 boys I don't reach for pink and purples so those new ones might not get much use. You projects are wonderful. Thanks for the inspiration! Becky... you are so ingenious.. love the cupcakes.. love it all! Wow! What a great gift this would make. Thanks so much for sharing the template and your wonderful creation. OK, you've done it again! I don't comment much but this time I have to. You ROCK! I love this box and as soon as I saw it I knew I had to CASE it. And then to see what you did with the cupcake stamp?!?! I have to CASE that too! I am constantly masking the words with scotch tape and it's a pain, so I'm gonna just CUT OUT the words! You've made me brave enough, I can do it! Thanks for the inspiration! Too cute and a great idea. I love how you cut out the centre of the cupcake. I think this is great! The Razzleberry is my favorite color! thank you for the detail, I'm doing a cupcake theme for my daughter's birthday. I left you a award on my blog. this is incredible becky! wow!!! This is truly adorable! Thanks for the idea about the stamp! I think I will cut mine out as well! Thanks for the ideas, Becky! You've also made me reconsider that cupcake stamp. I love how you utilized the DSP for the cup. Awesome, just awesome! I don't usually comment but LOVE your ideas and projects!!! It's nice to finally find someone who isn't a fan of the in colors! I thought I was alone! Your right.... Perhaps they'll grow on us! I didn't like the new in colors either the first time I saw them, but then I saw the catalog and saw them paired with other colors that seem to balance them and then I started to like them. The rasleberry lemonade is a bit over the top for me, but I luv the 'write stuff' and thoroughly modern. I can see myself using these combinations of colors. This is one of the CUTEST card and box set I've ever seen !! love, love, love cupcakes! Super cute cupcake project! I love the colors and the design! You did a fantastic job! Thank you so much for sharing! Hey becky, I love these darn things! I tried them three times, mine dont look half as cute as yours.. gonna give it another go this weekend... Anywhoo, I left you an award over on my blog, check it out! I love the cupcake box and cards!! I do have to agree with you about the new In Colors - they just aren't my style but will have to see what I can come up with. 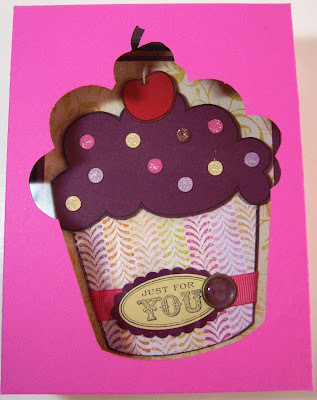 so very cute, and WOW on the tip for using the cupcake stamp!! Someone who agrees with me, I love the in colors that we have right now until the end of June. Thank you so much for saying what was on my mind. I just LOVE,LOVE,LOVE this!!! Awesome...it is so pretty & those cupcakes look so yummy. OK, this is just too dang cute. Thanks for sharing. Becky, this is a fabulous set you've made, and what a great idea with the stamp !!! The first thing I noticed in the picture was the box. I was prepared to be buying you tutorial, and then you just showed how you made it..THANKS! I definitely don't mind buying your tutorials, but it is so nice of you to just share. :) It amazes me how you are able to create cute things with stamps or colors that you don't particularly care for. Talent. P.S. I'm off to cut out my cupcake! I think I'm going to be getting a lot more use out of that stamp. Great idea! You always have the best ideas! I like cupcakes but I've never thought about buying this set because of the words on the cupcake because my son is also too old. But now, with your idea of cutting out the center...I have a new way of looking at this set and maybe others. Thank you! These are fabulous, you are one clever lady, a srunning blog, have purchase nearly all your tutorials in one hit, Wow!! OMG! Love the idea of cutting the words out. I like that stamp but I don't have young kids so had no need for it. You just sold me on this stamp. Guess I will be ordering it with my next order! 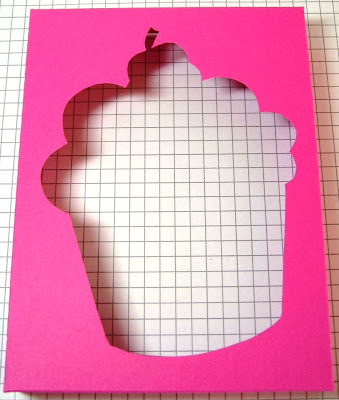 I am absolutely in love with these cupcake cards!! The idea to take out the 'sentiment' to use for other purposes - brilliant! OMG!! I can not believe I am just seeing this!! I love cupcakes and I have this stamp! I bought it because I love cupcakes. My kids are too old also. So, I am going to cut that corner right out!! Love the cards and the cupcakes look awesome! !